Oroville, CA--On July 27, 2017 members of the Butte County Sheriff's Office Special Enforcement Unit (SEU) along with members of Butte lnteragency Narcotics Task Force (BlNTF) served a search warrant in the 4400 block of Foothill Boulevard, Oroville. Located inside a large metal shop on the property was an elaborate indoor hydroponic marijuana grow. The cost of the hydroponic system equipment is estimated to be in excess of $500,000.00. A total of 778 marijuana plants were located in several different hydroponic rooms along with 132 pounds of processed marijuana bud, packaged for sale, The shop also held items used in the manufacturing of butane honey oil (BHO). Outside of the shop was a large enclosed trailer containing a mobile butane honey oil lab with equipment valued at over $50,000.00. 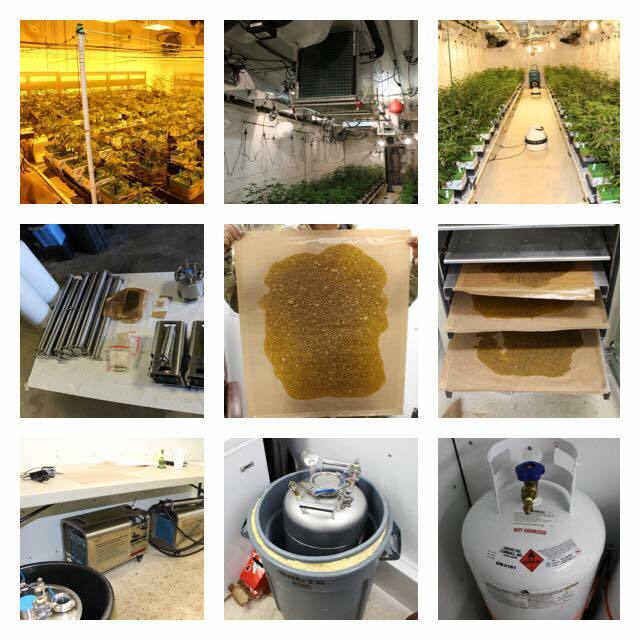 The remainder of the butane honey oil lab components were located inside the trailer to include two 100 pound tanks of a butane/propane mix, recirculation pumps, closed loop BHO system, and two large vacuum purge ovens, which were in operation and filled with sheets of BHO. ln total 16 pounds of BHO was seized. The value of the processed marijuana and butane honey oil seized is estimated to be $483,000.00 wholesale in California. Arrested at the scene was Destin Brown, age 36, of Roseville, California, Alejandro Villegas, age 46, of Boynton Beach, Florida, Adriel Noriega, age 25, of Bradenton, Florida, Mark Holtfreter, age 29, of Deerfield Beach, Florida, and John Delorenzo, age 37, of Deerfield Beach, Florida. All were transported to the Butte County Jail and arrested for manufacturing of a controlled substance, cultivation of marijuana, and possession of marijuana for sale. All have a bail amount of $102,000.00. Members of the Butte County Interagency Narcotic Task Force along with Chico Police conducted a raid at a home on Village Lane around 6:30 Wednesday evening. Detectives found multiple prescription pills, digital scales, and numerous smoking devices used for heroin and methamphetamine. They also found used syringes and a loaded 12 guage shotgun. Detectives arrested five people at the house. A sixth person was detained and later released. According to a Chico Police Department press release, one of those arrested, 36-year-old Krista Needham is reportedly employed as a health-care provider in both Chico and Oroville. Authorities are investigating whether Needham gained access to drugs through her employment. The identities of the sergeant and officer involved in the fatal downtown shooting of a suspect have been released. 50-year-old Sergeant Scott Ruppel, whose firearm discharged twice striking the suspect in the fatal incident, is on administrative leave while the shooting is being investigated. 38-year-old Cedric Schwyzer is expected to return to duty after he receives medical clearance. Both Rupple and Schwyzer were injured Sunday night after contacting the suspect who was reportedly held up in the bathroom of the Mid Valley Title and Escrow on Main Street. This after the suspect was reportedly shot in the chest by a security guard after he was allegedly stabbed by the suspect. Doctors say weapon used to stab Sergeant Ruppel narrowly missed the carotid artery in his neck. Officer Cedric received a stab wound to his head injuring his skull and according to police, he received numerous stitches to treat his wounds. According to a Chico Police Department Press Release, the still unidentified suspect succumbed to his gun shot wounds. The case is under investigation by the Butte County Officer Involved Shooting Investigation Team with the Butte County District Attorney's Office. 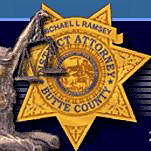 Butte County District Attorney Mike Ramsey announced today that law enforcement authorities are seeking the help of the public in identifying the man shot in an officer-involved shooting on the evening of July 23, 2017. Ramsey encouraged anyone with information about the unknown man’s identity to call the Chico Police Department hotline at 530 897-4911. Chico Police say one man is dead and two officers injured in a late night incident at a downtown Chico business. Around 10:30 Sunday night police were alerted to an alarm at Mid Valley Title and Escrow on 601 Main Street. A security guard located a suspect outside the business and made contact with him. The suspect allegedly stabbed the security guard. Police say that caused a significant wound. The guard reportedly fired his handgun at the suspect who then fled. Police arrived and entered the business and found a suspect in the bathroom. He allegedly slashed two officers in the neck and face. According to Chico Police Department Press Release. An officer fired his weapon striking the suspect and he succumbed to his wounds. The police officers were treated at the hospital and have been released. 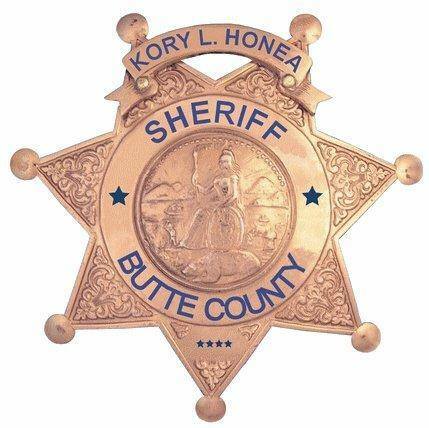 The incident is now being investigated by The Butte County Officer Involved Shooting Investigation Team, led by Butte County District Attorney Mike Ramsey. Police reported minutes ago that the northbound lane of Main Street has been reopened. A vegetation fire burns in Glenn County. The Creek Fire started near Stony Creek Drive north of Orland after 5 pm Wednesday. The fire has reportedly burned around 60 acres and is now 95 percent contained. The fire has burned dead grass as well as some trees. The foreword progress of the fire has been stopped. There were initial evacuations at homes nearby and the Shady Oaks R-V campground, but those orders have since been lifted. No structures have been damaged. One firefighter was injured overnight. Much progress is being made in the battle against a wildfire in the Chico area. The Humboldt Fire started in the area of Humboldt Road and Highway 32 just 2 miles east of Chico Wednesday. The blaze has burned 103 acres and is now 95 percent contained. The fire started in Chico Fire's jurisdiction, but the fire spread across Highway 32 into Butte County Cal Fire's jurisdiction. There were evacuation warnings for residents of the area, but they were cancelled after firefighters were able to quickly stop the foreword progress of the blaze. Fire crews contain the destructive Wall Fire. The blaze that started north of Bangor on July 7th burned 6,033 acres and is now 100 percent contained. That fire, at its peak, caused the evacuation of hundreds of Butte County residents. 41 homes were destroyed and 3 were damaged. 57 other structures were either destroyed or damaged in the fire. Fortunately, there were no injuries reported. According to the Cal Fire website, the cause of the wildfire is still under investigation. Much progress is being made to contain the Wall fire in Butte County. The blaze, that started last Friday north of Bangor has burned 6,033 acres and is 85 percent contained. 41 residences were destroyed and 3 damaged. 48 minor structures destroyed in the blaze. According to Cal Fire's website, No structures are threatened. No injuries have been reported from the Wall Fire. Police are searching for a homicide suspect after a body was found at a hotel in Chico. 39-year-old Marc Valcarenghi has been identified as the suspect after a body was found at the Safari Inn on the Esplanade around 7:30 Wednesday night. During the investigation detectives identified him and a 22-year-old woman to be connected to the victim. That woman who has not been identified was questioned and released. According to a Chico Police Department press release, Valcarenghi is still on the loose. Anyone with information on his whereabouts are asked to contact the Chico Police Department. Four vehicles collide with a big rig near Willows this morning. The pill up happened on Interstate 5 near County Road south of Willows after 5 am this morning. The CHP reported one vehicle overturned and a person was pinned underneath. That person was flown to the hospital for major injuries. The southbound lanes were closed while authorities worked at the scene. Those lanes were opened after 6:30 this morning. Evacuation orders have been lifted for residences affected by the Wall Fire. All evacuation orders and road closures were lifted on Wednesday. The Wall Fire has burned 6,033 acres since it started on Friday, north of Bangor. The fire is now 75 percent contained. The blaze is 75 percent contained. 41 residences have been destroyed and 3 damaged. 57 other structures have been destroyed or damaged. According to Cal Fire, current weather conditions continue to provide the opportunity for fire crews to make significant progress in containment. Fire Crews make progress against Wall Fire in Butte County. The wildfire started Friday north of Bangor off of Chinese Wall Road and has burned 5,800 acres and is now 60 percent contained. 41 houses have been destroyed and 3 damaged and 57 other structures have been either damaged or destroyed in the fire. According to Cal Fire, there are now 606 structures that are threatened. According to Cal Fire's website, firecrews continue to hold and improve fire lines and mop up hot spots. Cal Fire also says evacuation orders and warnings are still in effect. 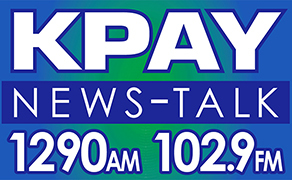 For information on those evacuation warnings and orders, you can find a link to the Live Evacuation Area Map on KPAY's Facebook page and right here on K-P-A-Y dot com. County Officials want to thank the community for what they say is an "amazing amount" of donations. Fire crews make some progress on the Wall Fire Butte County. The fire started just before 3 pm Friday in an area off of Chinese Wall Road, north of Bangor. The fire has burned 5,800 acres and is now 45 percent contained. 37 structures have been reported destroyed and 5 structures damaged. There are currently 5,400 structures threatened by the fire. According to Cal Fire's website, the fire activity has reduced significantly as crews continue to improve fire lines and make the affected area safe. Evacuations: Limited downgrading of evacuation orders for The area west of Miners Ranch Rd. from Hwy. 162 to Oro Bangor Hwy. All roads/areas north and south of Forbestown Rd. from the intersection of Highway 162 at Lumpkin Rd. All roads/areas south of Forbestown Rd. from Lumpkin Rd. to Robinson Mill Rd. Bangor Highway to Miners Ranch Rd. and Naranja Ave.
All roads/areas north and south of Swedes Flat Rd. to Robinson Mill Rd. All roads/areas east of Miners Ranch Rd. from Hwy 162 south to Swedes Flat Rd. All areas west of Miners Ranch Rd. and Dunstone Dr. from Hwy. 162 to Grubbs Rd. Everything to the north of Upper Palermo Rd. at Grubbs Road to Grubbs Road at Dunstone Dr.
All roads/areas along Foothill Blvd. at Oro Bangor Hwy. to Oro Bangor Hwy. at Lower Wyandotte Rd, continuing south on Lower Wyandotte Rd. to the intersection of upper Palermo Road and Grubbs Rd, encompassing everything to the west to Oro Bangor Hwy. All roads/areas east of Oro Bangor Hwy. at Foothill Blvd. 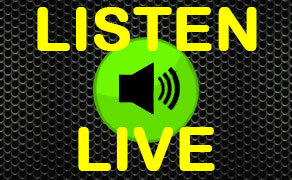 to Pinedale Ave., Pinedale Ave., north to Edgewood Dr., North to Hilldale Ave., west to Hwy. 162. All roads/areas along Glen Dr. from Oro Dam Blvd. East to Oro Quincy Hwy. and everything to the east of Glen Dr.
All roads/areas along Oro Dam Blvd. East from Glen Dr. to Kelly Ridge Rd. All roads/areas east and west of Kelly Ridge Rd. from Oro Quincy Hwy. up to Oro Dam Blvd. The Wall Fire started off of Chinese Wall Road north of Bangor just before 3 pm Friday. The blaze has burned 5,600 acres and is 35 percent contained. 17 structures have been destroyed and 5 damaged. 5,400 structures are threatened. According to Cal Fire's website: Approximately 4,000 people have been evacuated. All areas east of Oro Dam Blvd. from Highway 162 to Lake Oroville, including Canyon Drive and Longview Drive. All areas east of the follow roads: Arbor Ave. from Highway 162, Hillsdale Ave., Edgewood Ave., Pinedale Ave., Foothill Blvd. to Oro-Bangor Highway, Oro-Bangor Highway from Foothill Blvd. to Lower Wyando, Upper Palermo Rd. to the intersection of South Villa Rd. All areas north of South Villa / Grubbs Road from the intersection of Upper Palermo to Dunston Rd. Miners Ranch Road to Oro Bangor Highway west to Oakvale Avenue, including the Oaks and Skyline Blvd. Oro Bangor Highway from Swedes Flat Road to Avocado Road, including all connection roads and areas. All areas west of Miners Ranch Road from the intersection of Highway 162 to Oro-Bangor Highway., including the Oaks mobile home park, Mt. Ida Road, Skyline Blvd. and Oakvale Ave.
All areas south of Highway 162 from the intersection of Miners Ranch Road to Oakvale Ave.
All areas north and south from the intersection of Highway 162 and Forbestown Road to Black Bart Road. All areas east of Miners Ranch Road and Highway 162 (Olive Highway) and Oro Bangor Highway to Swedes Flat Road. All areas west of Robinson Mill from Forbestown Road to La Porte Road. Conditions: The fire continues to burn actively. The fire is burning primarily to the northwest and southwest. Hot dry weather is expected to continue in the fire area. Firefighters are working to establish and maintain control lines and reduce the threat of property damage. Evacuation orders and warnings are in effect. All areas east of the following roads: Arbor Ave. from Highway 162, Hillsdale Ave., Edgewood Ave., Pinedale Ave., Foothill Blvd. to Oro-Bangor Highway, Oro-Bangor Highway from Foothill Blvd. to Lower Wyando, Upper Palermo Rd. to the intersection of South Villa Rd. Oro Bangor Highway from Miners Ranch Road, south and west to Dunstone Road. Miners Ranch Road to Oro Bangor Highway west to Oakvale Avenue, including the Oaks and Skyline Blvd. All areas east of Miners Ranch Road and Highway 162 (Olive Highway) and Oro Bangor Highway to Swedes Flat Road. All areas west of Robinson Mill from Forbestown Road to La Porte Road. Traffic is being stopped at Olive Hwy / HWY 162 and Kelly Ridge Road / Miners Ranch Road (UPDATE). The following roads are now under an evacuation warning: All roads south of Olive Highway between Oakvale Ave and Miners Ranch Rd, All roads east of Oakvale Ave between Olive Highway to Miners Ranch Rd. The following areas are now under an evacuation order: All roads north of Forbestown Road between Lumpkin Road and Hwy 162, All roads east of Miners Ranch Road in the Mt Ida/Old Olive Highway area. Conditions: The fire continues to burn actively. The fire is burning primarily to the northeast, and southeast. Hot dry weather is expected to continue in the fire area. Firefighters are working to control the fire, and reduce the threat of property damage. additional evacuation warning issued on Foothill Blvd. from Dunstone Dr. to Miners Ranch Rd. Evacuation Warning for the No. side of Swedes Flat Rd. from Chinese Wall Rd. to Oro Bangor Hwy. now an Evacuation Order Oro Bangor Hwy from Jan Dar Rd. to Avacado Rd. and all connecting road are now under an Evacuation Warning. Immediate Evacuation Order for Hurleton Swedes Flat Road from Grand Oak to Swedes Flat and all connecting roads. Hurleton Swedes Flat Road from Grand Oak to Swedes Flat and all connecting roads. Oro Bangor Hwy from Jan Dar Rd. to Avacado Rd. and all connecting road are now under an Evacuation Warning. A missing Chico man has been found dead. The family of 56-year-old Stephen Odneal reported him missing after he left his residence on White Avenue on June 12th and they hadn't heard from him. According to a Chico Police department press release, a man was found deceased on June 23rd in the Chico area but he didn't have any identification and he was not immediately identified. However, authorities confirm that the body was that of Odneal. The cause of death in unknown at this time, but police do not suspect that foul play was involved. Chico Police are looking for a missing man. 56-year-old Stephen Odneal reportedly left his residence on White Avenue in the morning of June the 12th and has not been seen since. Odneal's family says that he doesn't have a vehicle or a cell phone. They say he also doesn't have the financial ability to pay for transportation or meals. His family doesn't believe that Odneal has any medical issues. Odneal is described as a white male around five feet tall and 115 pounds. He has brown eyes and blonde hair. According to a Chico Police press release, there doesn't seem to be any sign of foul play regarding his disappearance, but his family is concerned.